Gotta hand it to the good folks at Tröegs in Harrisburg, PA. The farther west from Philadelphia you go, the more likely you are to find fans of the Baltimore variety. Not at Tröegs. Or, at least they know who their most prized target market is. Way to go guys and represent. The only better picture that could have been used to scare the Yankees into submission might have been this picture. 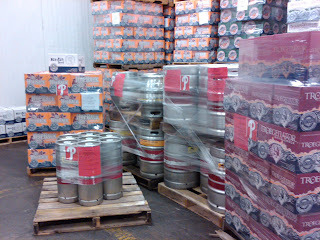 Imagine one of these on every pallet! LET'S GO PHILLIES!! 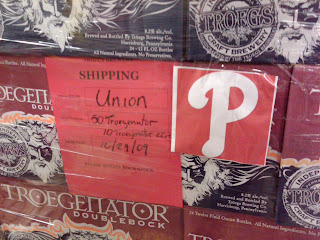 FYI... that was being sent to our wholesaler in Brooklyn... Go Phils!